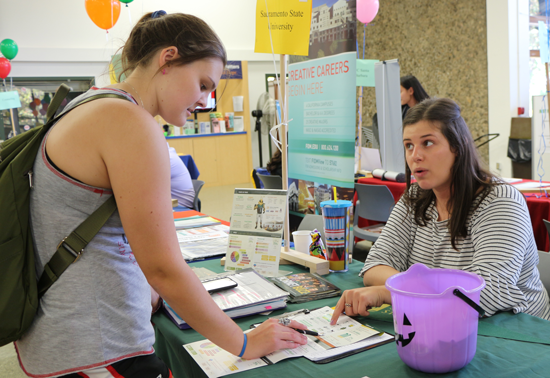 Transfer Day, November 1, attracted GECA, high school and Gavilan students to the Student Center, with more than 30 four-year institutions and 10 Gavilan departments tabling the event. 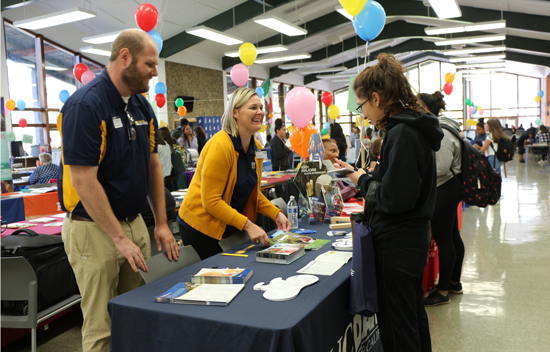 The Counseling Department displayed handouts and links, reminding students to start on their transfer applications now. Counselor Celia Marquez shared tools for students to quickly find information about the process. “As one of the many features in the college catalog,” said Marquez, “each degree articulated to transfer is clearly labeled.” Students can see this logo in the catalog next to all the designated transfer degrees. Each semester, incoming students register for a half-unit class, Guidance 210, either online or lecture. They learn about university requirements, develop educational strategies and build a class schedule based on their career goals. Working with their counselors, students create their individual educational plans, the pathway to their AA/AS degrees and transfer to a four-year institution. Students can also access one of the following links to explore details about the UC and CSU systems, including locations, degrees offered and the application process. These links are also available within the Counseling and Career Transfer Center website pages. Students can also click on Assist for additional information. about pathway options. Chapman will graduate from Gavilan in Spring 2019. Throughout the month of November, counselors have blocked out extended hours to meet with students in PB 19 to help them start, edit and finish their four-year college transfer applications. New to Transfer Day this fall, high school seniors from Anzar High School in San Juan Bautista and Central High School in Morgan Hill were invited to participate. Gavilan College Career Education paid for the students’ transportation. Counselor Jessica Weiler presented a college orientation noting the benefits of higher education at the community college, CSU and UC levels, and Financial Aid Specialist Denise Apuzzo took the students on a Gavilan campus tour. Sarah Fates about UCD science degrees. “We encourage students to go on tours, check out campuses,” said Marquez. The Career Transfer Center arranges tours. But if those don’t fit a student’s schedule, many colleges offer a virtual page for visits. The CSU application just asks for information, while the UCs request short essay answers meant to reveal a better picture of the student. It could be challenges a low-income student has overcome, or the strengths a vet brings to the university. “Above all, start working on your transfer applications now!” said Marquez. The deadline is November 30.